Since most of you weren’t able to attend our Showcase meeting in September to sign up for an interest group, I thought I would review the groups that would be the most pleased to see a new member or two or maybe even three. Healthy Heart meets in members’ homes on the first Sunday evening of the month for a healthy and delicious potluck meal. They have one opening in their group right now. Contact Jane Cooley for more information at 916-483-0302 or janecooley1@gmail.com. Board Games meets the last Friday evening of the month to relax and have fun playing a variety of card and board games. Contact Anne Rhodes at 916-692-5075 or rhodesmicasa@yahoo.com. Cultural History studies a few books each year that give insights about cultural innovations that have changed society. They meet the first Thursday of the month at 1 p.m. Contact Diane Preece at 916-696-8077 or dpreece@mcn.org. Readers’ Theater meets the second Wednesday of the month at 7 p.m. to read plays aloud. Here’s your chance to connect with your inner actress! Contact Diane Petersen at 916-685-5060 or ladypetersen@earthlink.net. Scrabble Just for Fun meets on the last Monday afternoon of the month at 1 p.m. Players play two or three to a board and have a great time! Contact Vivian Counts at 916-483-8827 or viviancounts@yahoo.com. Attention South Sacramento and Elk Grove readers: We have many members who live in South Sacramento and Elk Grove, including one who has suggested starting a new book group for those who live in that area and no longer relish driving across town for a group meeting. If you live in the area and would be interested in belonging to such a group, please contact Linda Cook, the Book Groups Coordinator, at 916-962-0653 or lindacook5833@comcast.net. Please also consider offering to chair the new group, since it won’t be approved by the Branch Board without a leader. Please let me know if you have suggestions about potential or current interest groups or book groups. I can’t guarantee they will be implemented, but I will certainly listen. You can contact me at 916-973-0821 or capeabody@comacast.net. 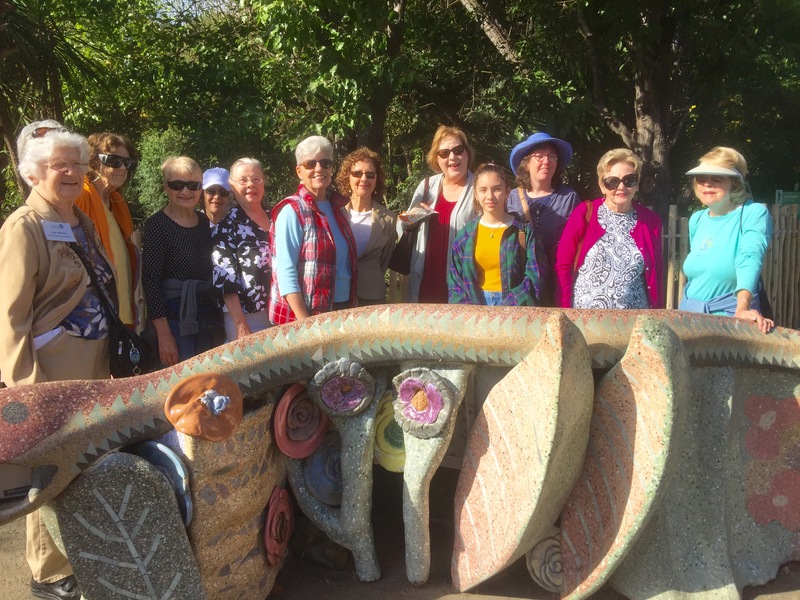 Eleven AAUW members of the Art and Architecture Interest Group, along with two guests, spent a lovely autumn day visiting the Sacramento Zoo to discover 20 pieces of sculpture crafted by artists with a Sacramento area connection. In this photo, taken by guest Chuck Hines, are (from left): Anne Rhodes, Ruth Ann Hines, Vivian Counts, Hazar Bazargan, Karen Smith, Linda Whitney, Bernardette Nunes, Carol Finney with guest Morgan, Ellynrose Sheehan, May Ruth Lynch, and Jennifer Stanley. The group is standing in front of “The Snake in the Grass,” a mosaic cement sculpture created by Donna Billick, who is the co-founder of the Davis Art and Science Fusion program and has a studio in Davis. This entry was posted in Interest Groups, Newsletter on October 31, 2018 by angelascarlett.